3D cute carton waterproof watch is best gift for your son, daughter, grandchild or others, it is best choice for the birthday gift, festival gift or visit gift for kids, our kids watch is prefect gift for 3-12 year old. 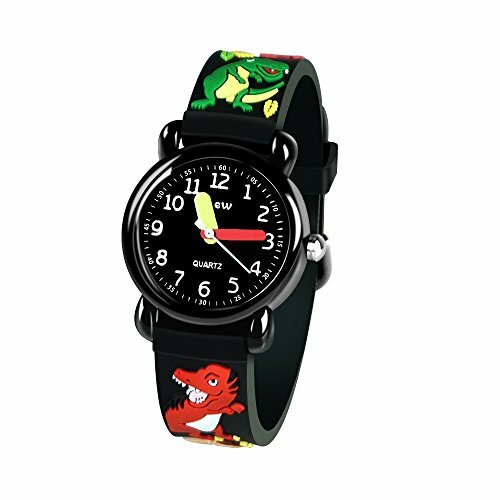 The funny cartoon style watches with its cute styled 3D cartoon design, each cartoon image is lively and interesting which any kids love it, it also help kids develop the good habit of valuing time, read time or understand how to tell time in a fun and engaging world effective, it is prefect gift and toy for 3-12 year old boy and girl. We insist on the use of traditional pointer&watch dial as the core design of our children watch, because we think teaching children to know the traditional clock, rather than use digital instead directly, it has very important significance. That's good choice for kids Birthday Gift. It's perfect fits for 3-12 years old Kids to learning how to tell Time. If Your child is learning how to read time or understand how to tell time in a fun and engaging world effective, it's best choice for kids, they will have their "OWN WATCHE". 1.withstands rain and splashes of water, not suitable for showering, bathing, swimming, snorkelling. 2.Please avoid the use in extreme hot or cold temperature. 3.Clean the strap by a soft cloth on regular bases is highly recommended. 4.Too much water contact will shorten watch life. REMARK: 3D kids watch kids gift for 3-12 year old girl and boy. Please DO NOT press any buttons in the water or wear this watch for longtime underwater activities-such as diving etc. Too much water contact or usage in extreme Hot or Cold temperature will shorter watch life.